Brand new for 2012, Roland Sands Design Motorcycle Gear is a new line of apparel designed for the retro-minded, über stylish rider out there. This line is unlike anything else we see in the industry at present time: a premium collection inspired by the old school and delivering a heritage look and feel with moto-specific protection capabilities and comfort. With a full line of leather and textile jackets, gloves and the "gentleman's starter kit" (which is a dopp kit, along with several wallets), Roland is looking to take a smash in the apparel side of things this year. Check out some of the highlights of the line below, and be sure not to miss our detailed blogs and video reviews of the entire line. First up is the standout leather jacket in the collection in our opinion. The Roland Sands Design Ronin Leather Jacket has full motorcycle functionality with a style that screams old school. 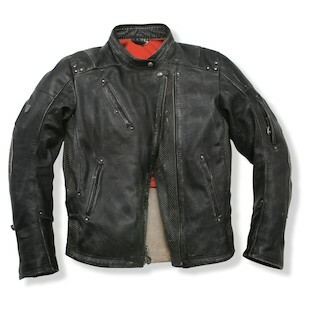 This is a classic leather jacket from a style standpoint but features pockets for the RSD/Forcefield CE rated armor at the shoulder, elbow and back. The premium 1.2mm grade A cowhide requires a five-day process of hand-finishing, washing and waxing for an excellent feel, finish and even smell. The RSD Ronin Jacket is a café inspired piece, with a shorty collar, front zip pockets, pre-curved sleeves and a performance race fit. There is strategic perforation for airflow and zippered waist gussets for a solid fit. Ultimately, the Ronin comes down to the details: premium RSD-embossed snaps, YKK zips and quality stitching define the look and feel of this standout leather option. 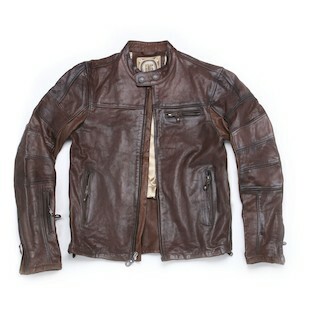 The Roland Sands Design Turbine Leather Jacket is another excellent choice in the throwback RSD leather collection. The Turbine uses the same leather as the Ronin, in addition to the five-day leather treatment process. The RSD Turbine Jacket has a unique style with its grommeted vent holes (amongst other grommets), short collar, and assymetrical pockets. The Turbine also has additional layers of leather in impact abrasion areas, at the shoulders, elbows and back. The interior features a soft satin liner with a special heat-embossed Roland "numbers" design that comes straight from his sketchbook! The Turbine also features pockets at the shoulders, elbows and back for CE rated RSD/Forcefield armor. The name of the Roland Sands Design Rocker Leather Jacket sort of says everything you need to know about this jacket. It is styled after the rock-n-roll jackets that we've seen for the past thirty years, and it incorporates modern day motorcycle functionality. There are pockets in the shoulders, elbows and back for the CE rated RSD/Forcefield armor, strategic steel rivets for reinforcement and perforation for airflow. The fit is designed to be comfortable in the riding position, and there are pre-curved sleeves and a drop tail. One really cool feature of this jacket is the additional treatment on the premium grade A cowhide that will wear and distress in its own manner based on your body and riding style. This is just another factor that makes this jacket incredibly unique. The Roland Sands Design Mission Leather Jacket is an American dirt track style jacket laced with old-school style and motorcycle riding performance. All the classic tracker features are there, with the strategic stretch paneling, zip pockets and the shorty race collar. The leather used here is the same as in the Rocker, and its additional layer will allow it to distress in an extremely unique and original manner. There are pockets in the shoulders, elbows and back for CE rated Forcefield/RSD armor in addition to external padding in strategic regions. The drop tail features a stitched and embossed RSD logo for style and the super comfortable satin interior features a custom Roland graphic design. Another dope piece in the lineup. 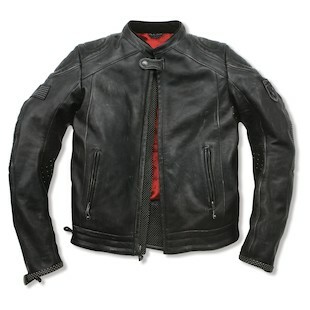 The last jacket in the RSD lineup that will accept armor is the Roland Sands Design Tracker Jacket. The Tracker jacket achieves what many jackets in the industry try to manufacture: it utilizes authentic US-made Martexin-waxed Shelter Tent cotton, a material used back in the day by the US Military (yes, in their tents). It has quite a unique look and feel to it and includes an extra container of Martexin Original Wax so you can continue to embrace that classic look and feel with new applications. This jacket is fully prepared to accept to the CE rated RSD/Forcefield armor to aid in protection from impact. This classic waxed cotton is proven to be comfortable and durable thanks to years of it being in use. Stay tuned for more write-ups about this new line as we release them.